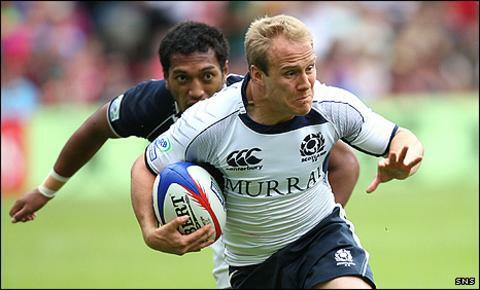 Scotland Sevens captain Andrew Turnbull believes the atmosphere at the Hong Kong Sevens should motivate the squad to raise their game. Turnbull, ready to face Samoa, Tonga and Mexico, was emboldened by his first experience of the event. "Playing in front of a 48,000 sold-out, banging stadium, it was quite an eye-opener for me," he said. "It's not something that scared me. It just spurs you on and makes you want to perform well." The 24-team tournament, which begins on Friday, is the fifth event in the IRB Sevens World Series and offers more points than any of the others. Scotland lie second bottom in the table, with eight points, two ahead of basesment side United States. England and New Zealand lead the pack with 80 points after four tournaments. Scotland's opening game in Group C is against Tonga on the first night of the tournament, followed by Hong Kong debutants Mexico then defending tournament and series champions Samoa. Head coach Graham Shiel's team flew from London to Hong Kong on Sunday and have spent the time since then recovering from the 12-hour flight, training and playing a bounce game against Australia at the So Kong Po training ground. Turnbull, preparing for his fifth tournament in Hong Kong, said: "First of all, you just need to get the journey out of the legs. "The first couple of days can usually be quite tough - you can pick up injuries if you go at it too hard - but, as a squad of 12, you don't get many opportunities to play against a full line of defence very often, while it also presents the squad with real-time problems that they would have to solve in a game. "The contact area has become quite big in sevens nowadays, so the ruck is a lot more competitive. It's good to experience that during the week and get used to what's coming up against Tonga in our first match. "Mexico, as is typical with most South American teams, will be pretty gritty. They'll get stuck in and enjoy the contact area and will prove a tough obstacle. "But, if we stick to our game plan and stick to our guns, we can come out on top of that. "Last up are the series and cup champions, who have that good South Sea island mix of power and pace, which can make them hard to shut down. "You have to be right on top of your game and not give them anything easy while getting something out of the game as well." After the Hong Kong event, Scotland will head for Australia, where they will face current joint series leaders England, seventh-placed Argentina and Commonwealth Games Bowl winners Papua New Guinea at the Adelaide Oval. The series then moves to London on 21 and 22 May, before finishing in Edinburgh at Murrayfield on 28 and 29 May. Scotland squad for Hong Kong and Adelaide Sevens: Mike Adamson (Glasgow Hawks), Tom Bury (Boroughmuir), Graham Fisken (West of Scotland), Michael Fedo (Team Northumbria), Finlay Gillies (Glasgow Warriors elite development/Heriot's), Fraser Harkness (Selkirk), James Johnstone (Glasgow Warriors elite development/Currie), Jonny Macdonald (Cardiff University), Ross Miller (Glasgow Hawks), Ross Samson (Edinburgh Rugby), Andrew Turnbull (Edinburgh Rugby), Andrew Skeen (Watsonians).